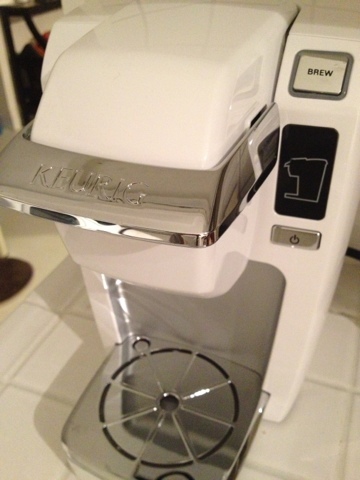 We Got A Keurig Mini Brewer! I saw this Kohl’s ad a few weeks ago and the color options immediately hooked me. The Keurig Mini brewer is on sale for $99.99 and you get a $20 mail in rebate. So that’s 80 dollars!! I’ve been wanting a Keurig because it’s so convenient but I couldn’t get over how wasteful those little k-cup filters are. After seeing this ad, KT did a quick online search and found that there are reusable k-cups! I was thrilled that my biggest objection to a Keurig was resolved. However, I still wasn’t sure I was ready to spend 80 dollars to replace a perfectly good coffee maker. I told KT I’ll think about it some more. A week later, I found this flyer in our mailing. It’s a Keurig rebate form! The rebate amount depends on which brewer system is purchased. For the Keurig Mini, it’s a 20 dollar rebate. Now, I did consider that this might be the same rebate that Kohl’s is offering. But if it’s not, it would be another 20 dollars off, bringing the price down to 60 dollars. I can really get on board with that. As I was sitting on this, I was also receiving emails from Kohl’s with their generous coupons. I recently received a 20% off coupon and it did not exclude sales items. So that means it is 20% off $100 with coupon, bringing it down to $80. Then with the 20 dollars rebate from Keurig, it brings the price down even more to $60. 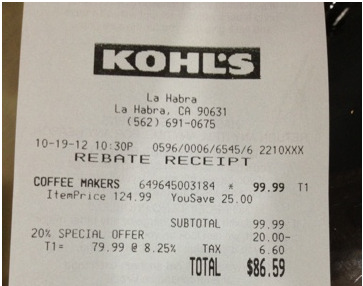 Finally, if the other rebate from Kohl’s is not the same as this rebate from Keurig, then that’s a final price of $40! Even if I can’t do two rebates, $60 is still pretty awesome. KT and I head to Kohl’s for a late Friday night shopping adventure. I know I said what attracted me the Kohl’s ad was all the beautiful color options but I decided on white. I figured I wouldn’t want to change out all our colorful appliances if I wanted to change the color of our kitchen. And even if I did decide to go with a color other than white, I wouldn’t know what to choose. I love the teal. The yellow was growing on me the longer I stared at it. And I love the bold statement from the red. So white it is. We use the 20% off coupon so purchase price was $79.99 plus tax. Then we got the Rebate Form from Kohl’s. I compared the mailing address for both rebate forms and determined that they are in fact, one and the same. =/ Oh well. Again, $60 dollars is still pretty awesome. This entry was posted in Kitchen, Look What We Found!.